Westchester is an unincorporated community and census-designated place in suburban Miami-Dade County with over 29,000 residents, located between SW 8th Street (Tamiami Trail) south to SW 40th Street (Bird Road) and SW 97th Avenue east to the Palmetto Expressway. The public schools belonging to the Westchester area include Royal Palm Elementary, Coral Park Elementary, Banyan Elementary, Emerson Elementary, Olympia Heights Elementary, Tropical Elementary, Rockway Elementary and Middle, Riviera Middle School, Miami Coral Park High School, and Southwest Miami Senior High School. The private schools in Westchester are St. Brendan Elementary and High School, St. Agatha Catholic School, Florida Christian, and Christopher Columbus High School. 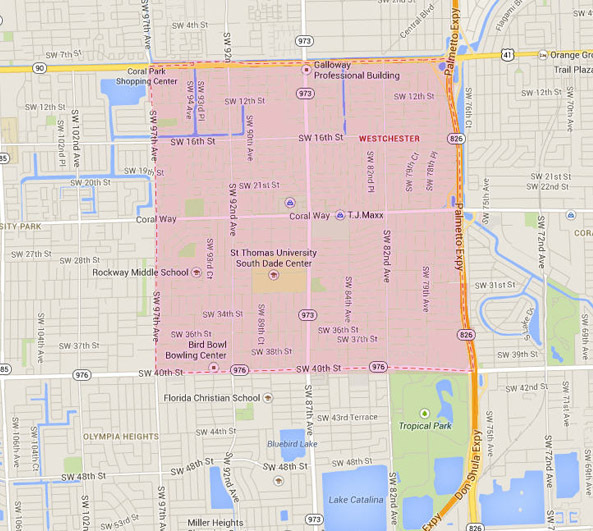 Florida International University (FIU) is near the neighborhood of Westchester. The community has seen more of an economic revival with the continuing growth of the FIU campus, which draws students and professors, both locally and internationally, to the area. Westchester is mostly a residential area. Visitors and residents can enjoy Coral Estates Park, Rockway Park and Banyan Park. Coral Estates Park has tennis courts, a large field for sporting games, a children’s play area, and a gazebo. Rockway Park offers swimming classes at the public pool and a nice green space for visitors to relax or enjoy sporting events, as well as a summer camp for children. Banyan Park has a large field for fun events and sporting activities. Besides the parks, the community of Westchester offers local shops and restaurants, while being minutes away from the Miami International Airport and Miami International Mall. If you have any interest living in Westchester, contact us and we will assist you with your real estate needs.